The apparel merry-go-round has been spinning quite heavily in the offseason, with a host of WTA players switching their on-court apparel for 2016, but one of the biggest sartorial changes of the year on the ATP side of things didn’t become visible until late Monday afternoon. After spending three highly memorable years with H&M, Tomas Berdych kicked off his 2016 campaign wearing Adidas in both press and practice. In the wake of Novak Djokovic shaking hands with tennis-newcomers UNIQLO, the Czech signed up with the Swedish brand in 2013, launching their tennis line and becoming a global ambassador for the world’s second-biggest clothing retailer. With Berdych switching over to Adidas, H&M will no longer be represented on the ATP Tour — possibly signifying the end of their (brief) foray into tennis. For the past three years, the diverse kits of the World No. 6 gave us plenty to talk about over the course of the past couple of years — for better or worse. In memoriam, or in celebration of, the partnership — let’s take a walk down memory lane with 10 of the best. For the first year of their partnership, H&M remained fairly conservative with their kits for the Czech — never really deviating massively from monochrome colors, while playing with different zip-up collars. They weren’t completely bland…but were not totally captivating either. Some time, presumably in the offseason between 2013 and 2014, someone poured the crazy juice into the designer’s coffee and we ended up with….this. Why was it half a size too large? Was it inspired by Argentina? Is Berdych a secret Sheffield fan? #allegedly, of course — but it’s where our story began. Few words are needed for this infamous flower-print top, which was elevated to greatness by the fact that his entire team sat in his box wearing the same t-shirt. We won’t forget the good times, #BerdycH&M. This wasn’t necessarily the most outstanding kit the Czech wore during his time with the Swedish brand — unfortunately, the shirt bore some resemblance to a pajama top. As a whole, the ensemble wasn’t terrible. The kit was coherent as far as sticking to grey, orange and white — which isn’t the world’s most awful color combination — and this time, the cap looked like it vaguely belonged to the outfit. 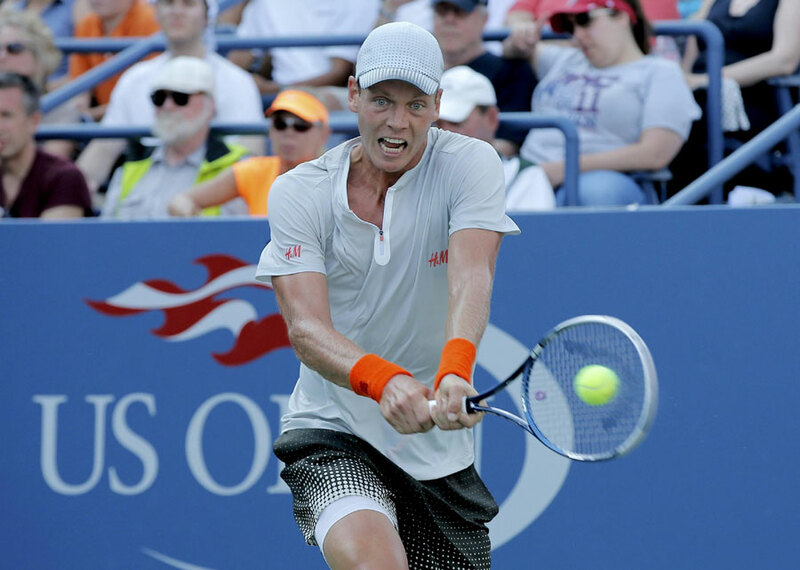 Berdych didn’t spend a lot of time in this kit — he was sent home in the round robin stage of the 2014 ATP World Tour Finals — but this is my personal, non-ironic favorite of all his H&M wear. The shirt was pretty great. It had just enough detail to make it interesting, but it wasn’t overbearing — the complete opposite of what came in 2015. When still — as if…..on a mannequin? — this didn’t look too bad, but once Berdych was on the move, this very-light turquoise, arrow-down ensemble became incredibly messy. That was quite a shame for the 2015 semifinalist in a way, because the color complimented the blue of the Melbourne courts rather nicely. The arrow-down pattern continued well into the clay, still pointing into the aimless abyss. The colors, once again, weren’t bad but the design was just far too busy. There was so much going on and so much that got lost once the Czech started doing….anything related to tennis. Memorable, but not in the good way. At the 2014 French Open, Berdych stood out due to his bold floral print. One year later, he arrived in Paris determined the blend in. A bright orange top and dark green shorts — possibly inspired by the official colors of the French Open? (Seriously, I’m grasping at straws here…) — ensured that he all but blended into the clay and the advertisement boards. Forget Stan Wawrinka’s shorts: this was the real fashion disaster of Roland Garros 2015. Shake your head all you want: for some reason, I quite liked this Miami Vice-inspired concoction. It’s loud, busy and looks like half a laser-show exploded over the kit — much like New York itself — but it works for me. Mind, the night-session took it a little too far — even for me. It’s fair to say that someone was slowly but surely beginning to have a laugh with this line. The weird Instagram-esque filters and effects? There was a lot going on here. A LOT. All the Miami Vice Laser kits are excused and forgiven. BEIGE. Different shades of BEIGE are your idea of dressing someone for the FINAL SHOWDOWN of 2015? Berdych might not have catapulted you into public consciousness the way Djokovic did with UNIQLO, but this was a cruel way to break up, H&M. Simply cruel. Whatever you thought #BerdycH&M was, we can all agree it was certainly I.CON.IC. Just imagine how hideous these H & M outfits would look upon an ugly player!! It’s only the fact that he’s a good-looking guy that they don’t look even worse IMO!